What do we hear everyday from the media, family members, and bros at the gym: if you eat clean and lifting weights, you’ll lose weight and get big muscles. In theory this is correct but can be seen as too vague and not nearly specific enough for “my” goals. In reality the most important part about training and nutrition is consistency. Let’s delve into this a tad more. Everyday we turn on the TV or open a magazine and there is a new diet that is going to get you that shredded body you’ve always wanted or the perfect training program to get you those rock hard abs you dream about during every set of planks and crunches. There’s just one catch; there is no secret method, no special acai berry juice, or amount of butter you can put into your coffee to fix consistency. 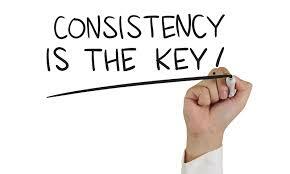 Consistency overrides it all. It doesn’t matter if you have the best trainer in the world and the perfect macros, if you can’t stick to it. That’s why we are big advocates of keeping it simple. Find a trainer or nutritionist you trust and respect and listen to them! There are millions of articles out there saying to eat 6 meals a day of chicken, broccoli, and rice and hit the weight room 6 days a week. This sounds good in theory but is this realistic? The answer is no because life happens. Kids have sports all around town, work runs over, birthday dinners, and normal stressors affect our mood and mindset when it comes to training and nutrition. And once you slip on your diet or training, you haven’t learned the necessary skills on how to recover from that. The reason is you were told that training and nutrition are black and white, but it’s not! Having a flexible approach to nutrition allows for the slip ups that happen and teaches us ways to bounce back or avoid the slip all together. I would rather you consistently hit your macros and allow yourself the treat of a cookie or slice of pizza everyone once in a while, then to force yourself into a super strict diet and feel like you failed every time you didn’t adhere. It truly comes down to calories in and calories burned per week. So understanding that you didn’t ruin your diet by having that cookie, but rather worked it into your macros for the day, which kept you within your calorie goal for the day, which kept our taste buds happy and kept us consistent in the long run. Same goes for training. Don’t think that every workout has to have the newest glute exercise in it while wearing an altitude mask and standing on a Bosu ball. These might look cool (that’s a lie, you look like an idiot) but what are they teaching us? And how are you able to track your progress if you are changing the movements every week? Keeping it simple and staying consistent can be the big factor in muscle gained and weight lost. Try doing some big, compound lifts (squats, deadlifts, etc.) and track the sets, reps, and weight used. If you aren’t increasing your total volume overtime, then you most likely won’t progress at the preferred rate. We have all heard the 10,000-hour rule, and it applies to lifting as well. Only way to get better at a lift is to do the lift more! When you stay consistent with hitting your daily/ weekly calorie goals, you will see more consistent results. When you do a lift more often and are able to actually track an increase in volume, rather than doing a different movement everyday, you will see more strength and hypertrophy in the long run. How do we make this happen without spending hours reading books on training or getting a degree in nutritional sciences; you hire one of our amazing personal trainers and nutrition coaches to put you on the consistent track to success.